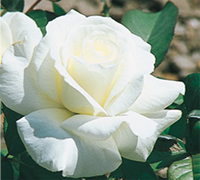 The white rose known as honor is a hybrid tea rose that stays somewhat compact, only growing about 4 to 5 feet or so in a given season, making it ideally suited for smaller locations where some larger roses just won't fit. The history behind Honor white roses is somewhat murky and hard to find precise data as there seems to be various dates as to when they were first introduced. The parentage of this rose is unnamed, however it was first bred by William Warriner from Tustin, CA in 1976. Jackson & Perkins first introduced Honor roses in the United States a few years later in 1980. It also seems this variety may have fallen out of circulation for some period and was later reintroduced by Bailey Nurseries in 2011. Honor white roses are frequently grown for cut flowers and you will often find this variety used in wedding bouquets and decorations. The classic white blooms are ample size, about 5 inches average diameter with up to 25 petals per bloom, and each one carries with it a subtle fragrance that is not too overwhelming. Growing Honor white roses requires a bit of experience and this is not a variety that is well suited to new rose growers as these could be considered high maintenance plants. For starters, they are not terribly hardy and require a lot of care when it comes to winter and frost protection. 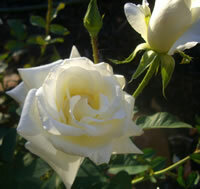 You can grow these roses comfortably in zones 7 and warmer without too much trouble. If you live in a colder climate however you will have to make sure you provide strong winter protection, as well as protection from the common spring frosts. Many growers choose to grow Honor roses in containers so that they can easily move the plants to warmer locations when the cold weather sets in. While this is not always practical for many growers' situations, if you have this ability you may want to consider this option. 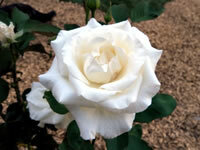 The Honor white rose will make an exceptional container rose. One good thing about this rose is it is a very vigorous grower and a high resistance to diseases. While you will probably find you will have to prune back your Honor white roses heavily each spring, they will grow back exceedingly well and fast with proper care. Planting Honor white roses requires careful consideration as this is not a variety that you can just place anywhere in your garden. If you are going to plant them directly in the ground, make sure that you select a location that gets good sunlight, at least 6 to 8 hours each day, has soil that drains well, and has a site that gets good air circulation. Now because this variety is very vulnerable to freezing, you may want to try and find a spot that is somewhat sheltered from prevailing winds. A good location for Honor roses might be up against the foundation of your home or other structure that will radiate heat over the cold winter months. Now obviously if you live in a very temperate climate, this is not going to be an issue for you, however if you typically get cold winters, this rose is going to need all the help it can get to survive. I have found that the smaller gardens up against my home tend to be good places for some of the less hardy varieties of plants, especially since I have a finished basement that is heated all winter long. If you are going to grow your Honor roses in containers, you will have to decide how large of a plant you want to maintain. There are certain benefits to growing roses like this in containers, most notably the ability to move the planter around to whatever ideal location you have throughout the year. If you pick up your Honor white rose from the local nursery, you will probably receive it in a 2 or 3 gallon container already blooming. This will give you a good idea of how big to keep the plant as it grows. Usually I find planters that are at least twice the size I purchased the rose in, and work from there. Taking care of your Honor white roses is not hard, but it does require diligence if you want good results. This is not the lazy man's (or woman's) rose by any means. I cannot stress to you enough that this is not a winter hardy rose, so make sure you heed my considerations above if you live in a region colder than zone 7. As for day to day care, there are few things you need to do that aren't just proper rose care. You need to make sure that you give your Honor roses proper water, typically one thorough watering every week. 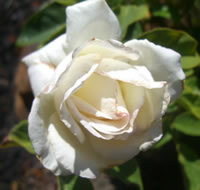 You can feed your roses with a good granular all purpose rose food in early spring, just as the leaves begin to form. Honor white roses will continue to bloom all season long if you dead head the spent blooms. That also means that you can help to encourage additional flushes by feeding your rose two more times in the growing season. Just make sure you allow at least 4 weeks in between feedings. Pruning Honor white roses should be done in early spring or late winter, just before the leaves start to form. Start off by removing all the old canes, as well as any that are diseased or dead. You also should remove any that overlap one another. If you live in a warmer climate, you will want to cut back about one third of the length of any canes that remain. If your climate is colder, you may find that you will have to cut them back to about halfway instead. It is also a good practice to mulch your Honor white roses generously as this will provide many benefits, among them protection from the cold.